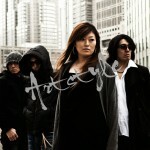 Artstyle is indies rock band originally formed in 2004. They quickly released their first demo and began working live gigs around the Tokyo city area. After going through several member changes, the band disbanded in 2008 only to return once again in 2009 on original member Garam’s Rock Project. Through it all the group’s sound has remained constant with a strong rock sound contrasted with the clear, distinct vocals of their lead singers. Their new album “Chain -絆-“ is currently available via the online store CDbaby!